While browsing the WetCanvas art forum a little while ago, I came across a few people talking about watercolour triads or primary triads, where artists use only the three primary colours – red, blue and yellow – as a limited palette to create a painting. Some of the triads used the ‘pure’ primaries, whereas some used a more muted palette, but it seemed like an interesting idea to me and a good excuse to try a watercolour brand I hadn’t tried yet. 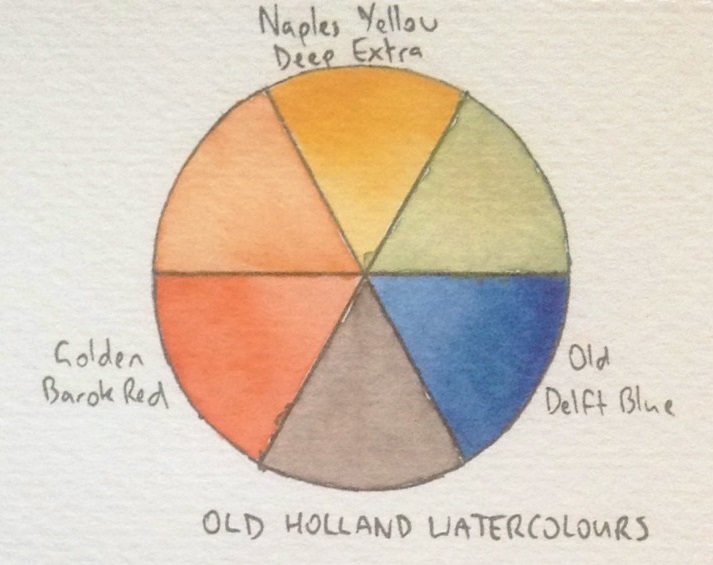 I already had one colour – Golden Barok Red – in the Old Holland watercolour line, so I ordered two other colours to experiment with my own triad. With 168 colours in the range, Old Holland is one of the largest watercolour ranges I’ve come across (second only to Daniel Smith paints), so if you didn’t know exactly what you were looking for, selecting paints could be a daunting task. Many of the paints have prefixes like “Scheveningen” (instead of Phthalo or Quinacridone) or “Old Holland” or “King’s Blue” in their names which don’t add to the description and make it harder to work out what the colour might be without actually seeing a chart. It seems that there are a lot of colours within the range that are quite similar to one another, which isn’t really a surprise in a range this large, but it does mean choosing a colour could take longer. Old Holland watercolour tubes don’t have the pigments or lightfastness information listed on them, which is annoying; you’d have to look them up online to see which colours have the pigments you want before heading into the store. Or before ordering online, if you live in Australia, since as far as I can see, no local stores carry Old Holland watercolours. It is worth checking the pigments, though, because while there are some nice single-pigment paints, there are also a lot of multi-pigment mixtures, which may look nice out of the tube, but they can have unpredictable (and muddy) results if mixed with other colours, and can have lightfastness issues if one or more of the pigments involved are fugitive. If you do find it online (Jacksons in the UK carry it), you can buy it in half pans or in 6ml or 18ml tubes, but at just under $10AUD for the smaller tubes in Series 1 colours, Old Holland is definitely not a cheap brand; it’s actually one of the most expensive I’ve seen to date, even knocking Winsor & Newton off its perch. Still, sometimes it’s worth paying more if the product is of higher quality than the competitor, but is that the case with Old Holland? After making my colour chart, I had a play with the colours I’d bought to find out. Given that my yellow was an earthy yellow and my red was an orangy-red rather than a primary or cool red, my triad results in a more muted palette (eg. I can’t make a purple but can make good browns and greys). The first thing I noticed was that the Old Holland paints seemed much thicker and gloopier than most other tube watercolours I’ve tried. When I put out a little blob to make a wash, it seemed to take longer to dissolve than other brands. Not necessarily a bad thing, but worth noting. When left on the palette, Old Holland watercolours rewet nicely (though it can take a bit longer to get them going) so if you want to make pans or half pans from your tubes, you can do so. The pigments also seemed highly concentrated, more so than most other watercolours I have. This meant I had to adjust how much I needed to use for thin washes versus darker washes, which was a bit annoying. Still, it means that a little goes a long way with these paints, which is about the only thing that makes their higher cost seem even remotely justifiable. Those who are used to other brands will find themselves having to go through a brief relearning phase to get used to using less paint (in my painting for this review, I think I overcompensated for this and ended up with paler washes than I should have used). These watercolours also seem to rewet well on the paper, so if you make a mistake, most colours can be lifted out with a tissue after you wet it with a brush. I did find that it made it a little harder to layer colours as even once the lower layer was completely dry, putting a thin glaze over it would pick up the under layer and mix the colours. With most other watercolour paints I’ve used, the under layer pretty much stays put once it’s dry, unless I drench it again. 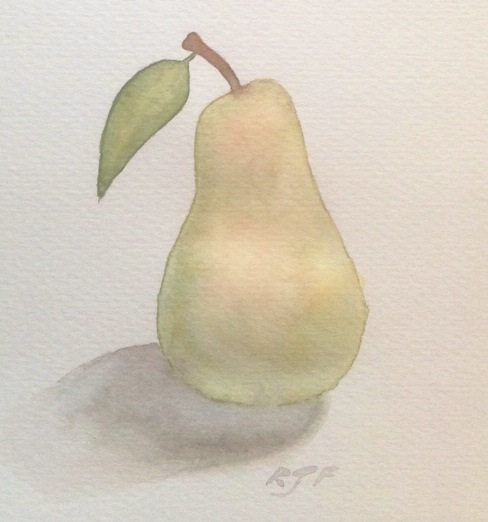 Below is a painting of a pear I did with my Old Holland triad. 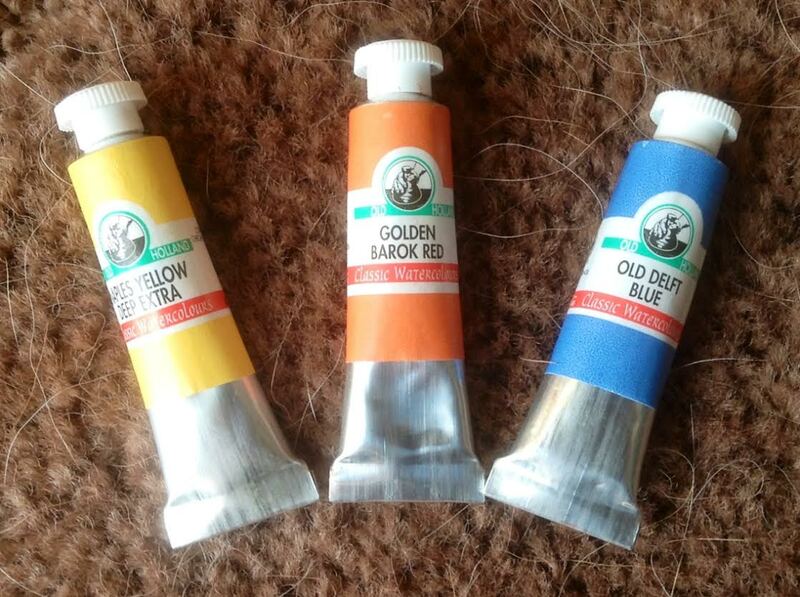 Though Old Holland paints are certainly not bad quality, their exorbitant price, lack of availability, somewhat gluggy consistency and abundance of weird mixtures and wanky colour names mean that I can’t wholeheartedly recommend them. Yes, they will get the job done, and they do have some nice colours you can’t get in other brands, but you can buy many other watercolours that are just as good (if not better) and will get the job done for a fraction of the price, even when you do take into account the higher pigment concentration. This entry was posted in Materials, Reviews, Watercolour and tagged Old Holland, Painting, Watercolour. Bookmark the permalink. you can find OH watercolours (in tubes and pans) at the Parkers Art Supplies, Rocks, Sydney. For some reason, they don’t list them on their online store. Can’t remember the prices, though and tubes can be very old, so I had several that the pigment and binder divided… (and shaking didn’t help much) If I were to buy from them again, I may try the pans. I can update that Old Holland watercolours (including Barok red) are now available on the Parkers website. Yay! Can’t speak to the age/quality of the tubes yet, as they haven’t arrived. I will likely stir them with toothpick before use, to better redistribute the contents. It’s awful to get a flood of binder at the start, since it’s nearly impossible to get it back in the tube. I know some people have success using a syringe. “wanky colour names” 😀 They do have some of the last remaining tubes of manganese blue PB33 lying around. It’s a lovely granulating colour that’s gone extinct.